There’s no traffic at all in this postcard view of Columbus Circle looking toward Central Park, which makes it easier to see the Christopher Columbus statue, built in 1892 as part of the city’s commemoration of the 400th anniversary of Columbus sailing to America. 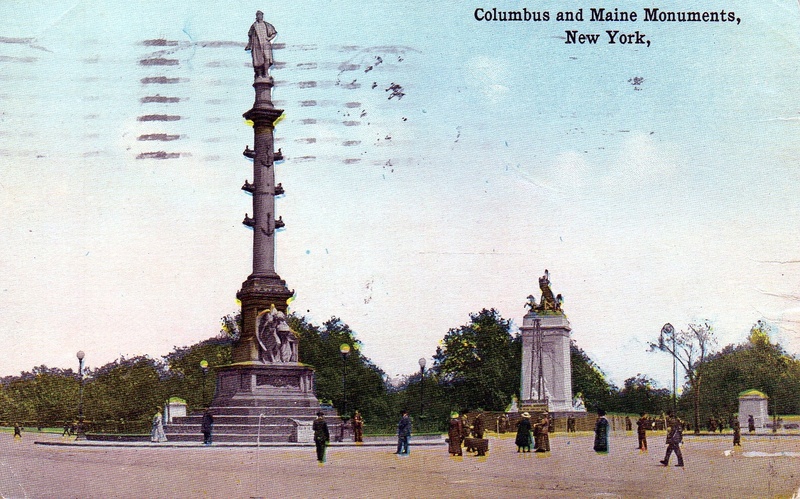 The Maine monument is in the middle of the postcard. Unveiled in 1913, it honors the 262 seaman who died when the battleship Maine mysteriously sank in 1898 off Havana. Interestingly, the statue was the winning design in a contest co-chaired by none other than William Randolph Hearst. This entry was posted on August 16, 2010 at 5:32 am and is filed under central park, Disasters and crimes, Politics, Transit, Upper West Side/Morningside Hts, War memorials. You can follow any responses to this entry through the RSS 2.0 feed. You can leave a response, or trackback from your own site. Today, in 2010, the Columbus Circle statue plays an enormous role in my life because I habitually walk by it. In my opinion, Columbus Circle is the most important artery of the city because the circle built in 1892 symbolizes the discovery of the new land of America. Tourists flock to the monument featured in the photograph not only because it is near both the Museum of Arts and Design and the Time Warner Center, but to admire its beauty. Unlike the slogan of the blog, the statue is not faded and certainly not forgotten. The newly renovated monument has a strategic location at the southwestern corner of Central Park. The postcard on the blog shows the transformation that the city has made since the monument was first built. Not only does the park look different, but 59th Street now has many cars and buses. In other photographs of Columbus Circle taken in the early 1900s, the statue appears as large as the buildings surrounding it. Today much larger buildings have replaced the older ones and show the growth of the city and the country. Frederick Law Olmsted designed central park; he wanted the circle to be the entrance. The circle however, was designed by William Eno. The Statue is seventy feet tall and three bronze sections to symbolize Columbus’ three ships. This blog got me thinking about why I had not previously thought about the statue. Why is Christopher Columbus glorified with statues, a holiday, and even universities? Yes, Columbus is credited with discovering America, but did he really discover it? After doing some research, I learned that on his first and second trips to America, Columbus landed in the Caribbean. There Columbus and his men raped women, kidnapped hundreds, and killed and cut off the hands of indigenous Caribbean people who could not bring him gold. Yes, Columbus may have launched European travel to America by bringing back evidence of its existence. However, Columbus clearly did not discover America because people already lived here and it is also likely that other people from Europe had completed the journey before him. So I ask myself, why is there a monument in the heart of New York City honoring a cruel man who did not discover America? Columbus symbolizes the success of slavery in the Americas. It has nothing to do with his Italian heritage, like Hitler’s German heritage.